I have a fair share of lofty goals in my life, though most of them include adding one more piece of bacon to a dish that already has plenty. Taking a one-way trip to Mars sounds great in theory, but I don’t think I’d be able to leave behind all of my Earthly fixations, including you, our wonderful readers. As such, my application never made it to the Mars One mission office, but over 202,000 other ones did, and Mars One has whittled that giant list down to 1,058 applicants in their first round of cuts. Granted, that’s still a huge number of people to get through, since they’re hoping to wind up with 24 potential astronauts in the end, but they probably got rid of all the people who listed “pleasing your mom” in their set of special skills. PopSci broke down the remaining applicants in a number of ways that let us know what kind of people might be furthering humanity’s galactic advancement. Of those remaining, around 55 percent are male, while the other 45 percent are obviously female, and though that’s still not as perfectly balanced as it could be, it’s far more equal than I would have predicted. I suppose it’s because Mars One is a Dutch company rather than an American one, where our gender bias is far more obvious. Considering NASA recently made it public that females are far more affected by space radiation than their burlier counterparts. The Americas make up 43 percent of the applicants, while Europe and Asia follow with 27 percent and 21 percent, respectively. Africa has five percent and Oceania has four. This could be looked at as the Americas getting some kind of an unfair advantage, but I’d prefer to think of it as “more people just want to get the hell out of the Americas.” In total, 107 countries are represented. To break it down by age, people who are 25 and younger make up 34 percent of the applicants, which makes sense given it’ll be another nine years before the first flight is planned. Two percent are older than 56, while those in between make up the remaining 65 percent or so. 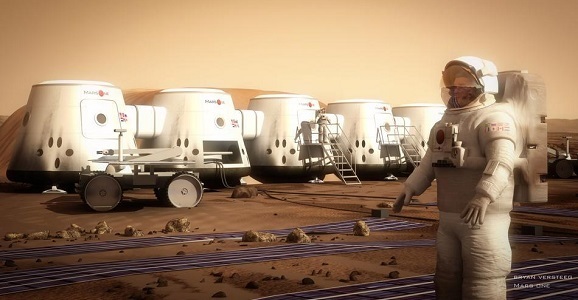 For more information on the proposed Mars One timeline, check out this detailed infographic. While it still seems like a far-off pipe dream, a huge step for the mission was made earlier this month when Mars One signed with Lockheed Martin, and Surrey Satellite Technology Ltd. was given the contracts to develop the official lander and data-link satellite to be used for a 2018 exploration mission. Is there anyone out there who applied and got word that you were accepted? Let us know in the comments, and please accept our congratulations. If you could just drop off this library book on your way to Mars, though, that would be sweet.